Magic Crust Quiche with frozen broccoli. Broccoli mixes well with a variety of flavors and sauces and can be used in a many recipes. The convenience of frozen broccoli makes it easy to add to soups, casseroles, egg dishes and more. Part of the MyPlate Dark Green Vegetable subgroup, broccoli adds lively color to meals and provides nutrients such as dietary fiber, folate (folic acid) and vitamin C.
Frozen broccoli works well in soups and provides a colorful way to add vegetables to your day. Serve as a starter, side or main dish and top with a dash of pepper for a little extra spice. This hearty casserole with broccoli and chicken is delicious and easy to make. The top layer browns and puffs during baking and is sure to provide “bragging rights” for the chef! 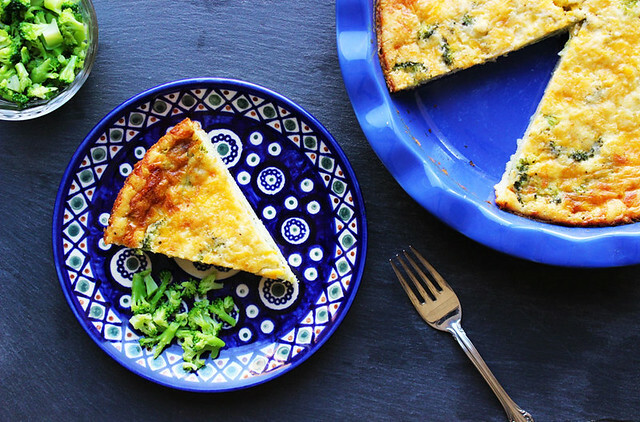 Quiche makes a great breakfast, lunch or dinner. This recipe starts with a tasty broccoli and onion filling that is topped with a crust batter that “magically” forms at the bottom as it bakes. This savory combination of broccoli and corn takes only three steps to prepare and certain to become a family favorite. Just mix, top and bake on a busy weeknight! Try this spin on a classic! Broccoli with a cheesy sauce is a delicious combination so “mix and mash” for a new twist. Find more of our “5 Ways” recipes and infographics at www.choosemyplate.gov/5ways. For more healthy recipes, check out www.whatscooking.fns.usda.gov, and learn more about the Vegetable Group at ChooseMyPlate.gov. Follow @MyPlate on Facebook, Twitter, and Pinterest, and sign up for MyPlate email updates at ChooseMyPlate.gov/GovDelivery. Try these tasty recipes featuring frozen broccoli. Click the image to view a larger version. Was thrilled to see this article to use frozen broccoli because it is my family's favorite vegetable. We try to eat fresh when we can but having recipes tailored to your modern busy life is awesome! We have tried all of them and love all of them. We sometimes add fresh herbs of our liking to enhance the flavors. Why not use fresh broccoli for all the ricepes ? I enjoyed this article about broccoli, but couldn't find the recipe for broccoli soup...also, when I get the recipe, can it be made in a crock pot? I would serve to my kids with ice cream. I will put some in my bake pies. I will put some cold in a bowl in eat things . I mix them with extra fruits.i will make a smoothie with them. Looks exciting! Can't wait to give it a try. Broccoli is one of the two vegetables that once you put in your diet, helps you with your sugar in your blood. I learnt that from a very beautiful Canadian, MD, WHO wrote in his site that makes our cells to take sugar in. Otherwise, it accumulates outside our cells and have a lack of sugar, because our cell doesn't hear the kitchen bell, so as the door to open and let the groceries (SUGAR) come into the kitchen(CELL). Make your food, your medicine. So broccoli is a wonder food and is so good for women, too. Peas is the second vegetable that do the same. Now combine broccoli and peas and you have your sugar blood tamed. As simple as that. Add it in your daily food and your Children won't have sugar problems. Of course, if you take a spesific medicine which prohibits having salt and sugar while you take it, then sugar problems can arise. We say that when we cry, our sugar lady is broken down; then we give sugar to small Children so as to fix their sugar lady. Being sad is bad, too. May you have Health and joy you and your family and all your coworkers. Salt and sugar and water are what our cells need in order to survive. @Verneta Stebbins - Glad you enjoyed the blog! The Cream of Broccoli Soup recipe is available at: whatscooking.fns.usda.gov/recipes/supplemental-nutrition-assistance-program-snap/cream-broccoli-soup. While many soups work well in a slow cooker, this recipe seems better suited for the stovetop. @Any Neuvecelle-Buckles - Thank you for reaching out! Fresh broccoli can be substituted for frozen broccoli in the recipes. Can we have apples or pumpkins ideas next. Thanks for being a good resource. I sthere any way that we can share this on Facebook or be able to copy/paste or link to my PE blog? @Stephanie Lawson - Thank you for your interest! We appreciate your suggestions and thought you may enjoy our previous pumpkin recipes: www.usda.gov/media/blog/2016/10/20/fall-here-celebrate-pumpkin-5-different-ways. Please feel free to link to the Broccoli 5 Ways blog, here is a shortened link if helpful: go.usa.gov/xUEBs. I'm very interested. Keep 'm comin'. Thanks. Thank you UsDA for helping us find ways to incorporate more fruits and veg into our daily meals. Healthy and delicious... and so convenient with frozen broccoli!